Here’s an assignment with a high degree of difficulty: give a presentation about how to present. I’d tackle this challenge by starting with an exercise that involves the audience right away. For example, ask participants to share the worst presentation habits they’ve encountered. This not only warms up those in attendance, it sets the stage for the content you’ll share. Forget that you’re up there not to promote how wonderful you are, but to provide value to the audience. Fail to set objectives. Even if you don’t share them with participants, know what you want to achieve. Proceed without a plan (also known as an agenda). Whatever you call it, it’s a map for how your session is going to go. Wing it. Preparation is everything. Unless you’re an improv master, you have to figure out what you’re going to do, in what order and for how long. And almost everyone needs to practice. Jump from point to point in a disorganized way. See #4 and #6. Go on and on (and on and on). I’m sure you’re fascinating, but respect the fact that people are busy and need you to be as time-efficient as possible. Rush through your presentation. In some ways this is the opposite of Tip #7. But when you have to cram a lot of content in a small amount of time, the problem is you haven’t planned well enough. Flat-line. Hey, you were invited to this party. Don’t leave your energy and enthusiasm in the car. Read exactly what’s on the slides. If you’re not providing context and meaning, next time just email the slides to participants. Read your speaker’s notes. 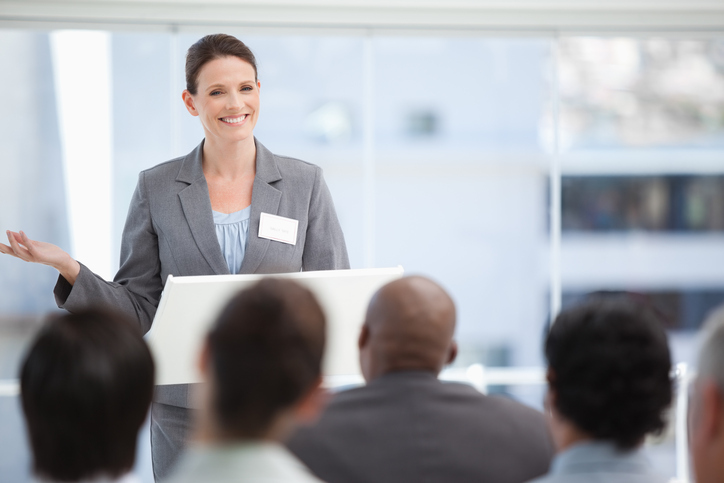 Ideally, you’ve mastered your presentation so well that you don’t even need notes. But if you do, they should be boiled-down bullet points that just help you remember key facts, not a full-blown speech. Try to be someone you’re not. This is your presentation. You should say what you want to say, in a way that fits your style. Use only a few slides. Slides are free. And using a lot of slides has three benefits: It keeps your presentation moving. It lets you put less content on each slide. And it continuously gives the audience something new to look at. Forget the power of visuals. Words on a slide are okay, but photos, cartoons, drawings and any visuals are better. Speak at participants instead of interacting with them. Yes, there’s information you need to share. But the real power comes in participation. Make it a two-way experience. Ready for your next presentation?